It all started with trying to get a little more organized in my studio. I need to get rid of fabric. There are so many shelves, that I never even poke through. I’m thinking this is the year to bang out some quilts for charity. I can definitely see how my taste has changed over the last 30 years….. Not that I think charities want ugly quilts. It’s just that our tastes change and evolve and I’m into brighter and bolder or straight up neutrals right now. And I need space. Today, at stake, a whole lot of 80’s mauve florals. Almost all of them tiny, little florals. Not a variety of small, medium and large. No, just small ones. What’s the deal? Is that the only thing my LQS sold back then? I can really only recall ever making one mauvy colored quilt, but I sure have a stash. This picture is only a third of it. The better looking third… Ack. And yes it’s mauve, not pink. 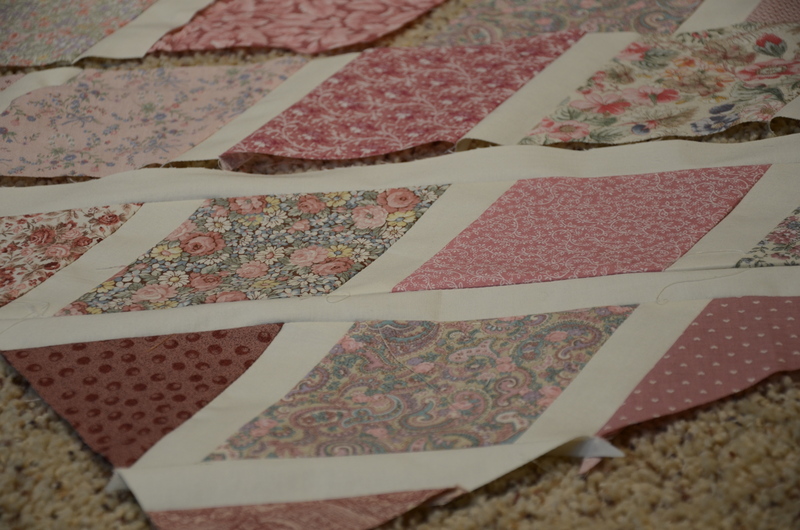 I’m thinking that since every quilt I make seems to be my new favorite, that I have a real challenge in front of me. How to take what I’m no longer drawn to and make it pleasing to *my* eyes. And besides, I was just ready to start cutting something today without too much thinking. This hit the table and then the floor. I have struggled with my Jane Austen~esque quilt, that I packed away before Christmas, getting the corners and edges lined up. With the diamonds set on point and so many bias edges it just seems like the half diamonds, around the edges, should have an added seam allowance to make the math work, not just the diamond cut in half. Does that make sense? Since I didn’t have a pattern and I didn’t want to waste to a speck of my Kaffe Fassett fabrics, I thought I’d toss this out there to play with. It’s coming together but I’m still not sure about those seam allowances. Anybody? Isn’t it funny how the fabrics look so much nicer in a quilt as opposed to in a cabinet? It still amazes me…. As for other projects, I did get my super secret quilt completed and shipped in time for Christmas. I couldn’t have been happier with it. It is Zen Chic’s White Labyrinth. Check it out. It is the only one I have seen outside of Brigitte’s, at the Quilt Show and I’m pretty proud of it! Still have my Bubble quilt to get basted up and get ready to quilt. No sign left of Christmas around here. We did get it all cleaned up and packed away, even did some deep cleaning of the Christmas decor that hasn’t been used in ages. Hopefully someone at Goodwill will find some deals…. Oh and I found two large tubs of the really old quilting fabrics… From the beginning of time. 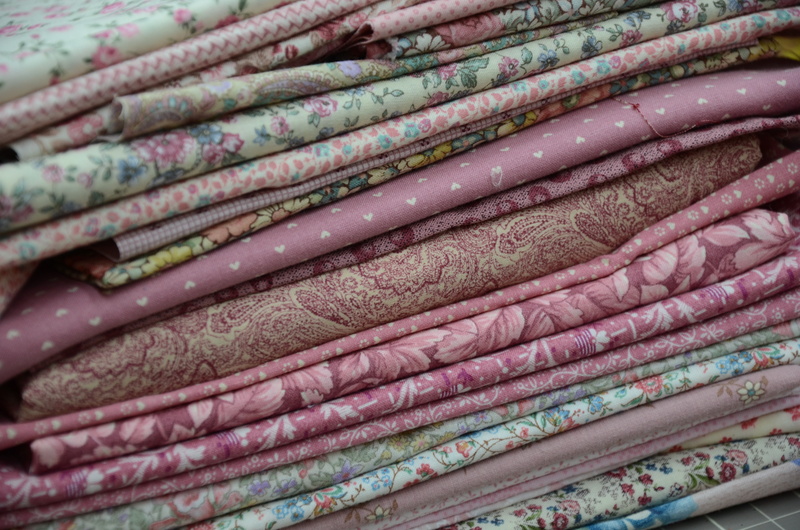 Anybody have any great ideas for really scrappy quilts??? That look good with ugly fabric?? I haven’t even been through all my Christmas pictures, yet. I have *got* to do that soon. Will post them when I do. I think I’m still getting over all the busyness of Christmas and all the travel we did over the holidays. It was a most enjoyable time. We got to spend quality time with everyone this year. But boy am I tired. Oh and I have one heck of a cold, I have to get over that, now. On a side no note, I am looking for a backpack vacuum and am thinking about this one. Does anyone have one or have opinions on one? Thanks for any input! This entry was posted in fabric, Quilting, Sewing and tagged diamonds are a girls best friend quily, fabric, inventory, jane austen quilt, kaffe fassett fabrics, quilting. Bookmark the permalink. 16 Responses to Are there any ugly fabric, quilt challenges out there?? I made sure to post this for WIP Wednesday hoping someone had the answers. I had never thought to use the uglies for test patterns. Pretty lame of me! I may experiment and add in extra seam allowances and see if that works better. I’ll blog it, if I do. I could not agree more..where did all that ugly fabric come from. I am trying to use it up as well and the fabric is always better in a quilt. Good luck! The quilt looks great. Thank you, Beth! I seriously have no clue how I came about owning so much of it. And mauve is only one of the colors! I just chucked two bags full! I couldn’t stand it. I did keep a few odds and ends that were more “sentimental”. My husband told me I should chuck it because there is not enough time in my life to quilt up all the uglies I own. 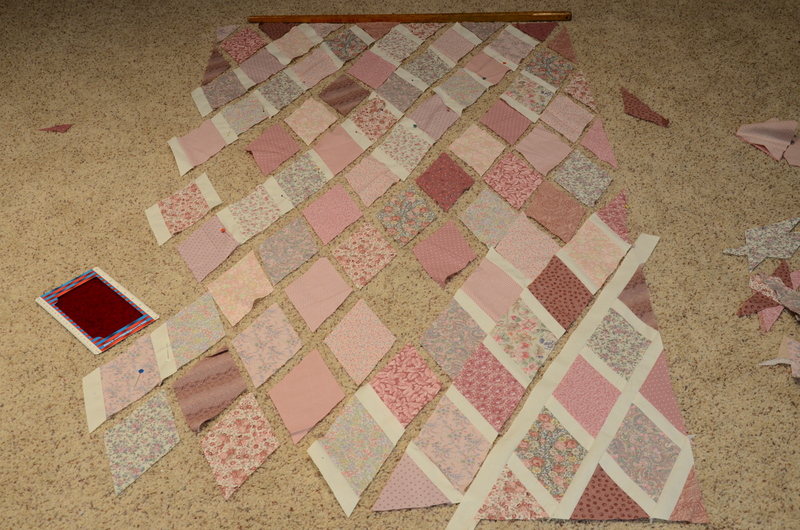 I’m going to challenge myself for a couple, of quilts, at least, or until that beautiful new idea presents itself…. I’ve sent ugly fabric to our quilt guild. I also piece it together to make quilt backings. I’m trying to convince myself to use up some the the larger pieces for backings but by golly it’s just a big ugly backing, then! 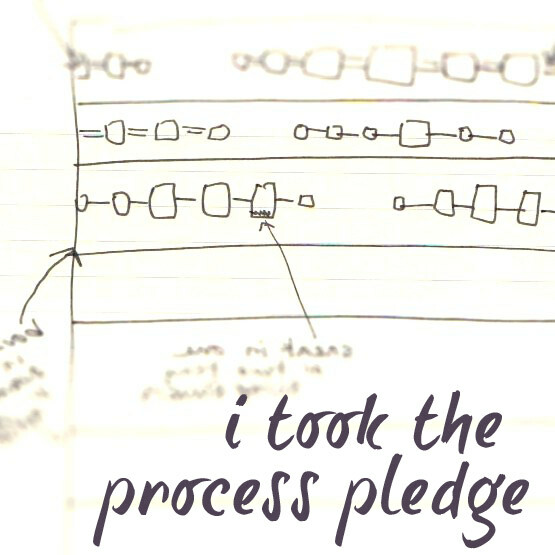 I need a quilt guild…. Okeee…I think I have some of these mauv-eee/pinks in my stash. But, I think they are way back to the early 80’s. Uh-o…does that mean they’ve been calling me for a VERY long time to put them in a quilt? sorry, I made them feel bad for so long. I better get ’em out and see who else they could play with in a quilt. Jeesh, now you’ve got me feeling really badly about the country blues and teal greens…. If you still have a tone of your old “uglys” you should kit them up and start a quilt challenge. A local guild in my area did that and it became a huge sucess. So i would sujest mabey get a bunch of people from ethier local to your blog followers and then you can suplly everyone a kit, stippulate any rule you want such as, you must use all the fabric in the kit, and it must be reconisable, and or make a size rule two. The guild that did it had all the ladies kick in a entery fee of $20 and they then donated the proceads to a charity and game a small pot to then winners. And then they donated the finished quilt to local charity susch as hospics care nursy homes and premature baby at the hospital. Hope this helps. Please tell me what the size of the blocks are for ” Diamonds are a girls best friends quilt. I love it! I am traveling and can’t quite remember. I know that for my next one I needed to buy some variety fabrics and I could just get the width out of a 6 1/2″ square. Seems as if when I made this one I cut something like 4″ strips, then cut my diamond pieces from there. You can play with it and I’ll get back with you in a week if you haven’t figured it out by then.